Cara Brickwork invited State of Mind Sport to deliver a Mental Fitness and Wellbeing presentation to employees on their sites at Venmore Care Hub & Speke Care Hub. Cara employees were also joined by the Willmott Dixon site team in addition to a number of other sub-contractor Supervisors. The presentations were hosted by ex-Rugby League professionals, Danny Sculthorpe and Phil Veivers, who use their knowledge and experience of life as professional sportsmen to raise awareness around mental fitness and wellbeing. During the session each presenter shared their own personal story with the audience. The State of Mind programme was established in 2011, following the unexpected death by suicide of Terry Newton, a well-regarded Super league player. The aim of the charity is to raise awareness and improve the mental health, wellbeing and working life of rugby league players, staff and local people across the rugby league communities. 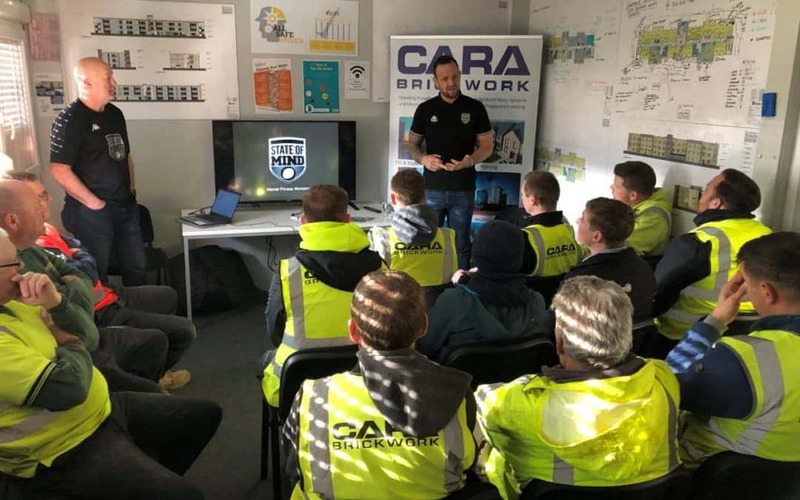 This was the first of a number of presentations that Cara Brickwork will be hosting on their sites across the North West.